Rather than going into poetic raptures about how I discovered this wonderful recipe, I’m simply going to transfer it directly from the Cook’s Illustrated recipe originally published years ago. It has served us well for as long as I can recall. Try it, you’ll like it! 1. For the glaze: mix all ingredients in small saucepan, set aside. 2. For the Meat Loaf: Heat oven to 350 degrees. Heat oil in medium skillet. Add Onion and Garlic; saute until softened, about 5 minutes. Set aside to cool while preparing remaining ingredients. 4. Turn Meat mixture onto work surface. With wet hands, pat mixture into approximately 9-by-5-inch loaf shape. Place on foil-lined (for easy cleanup) shallow baking pan. Brush with half the Glaze, then arrange Bacon slices, crosswise, over the Loaf, overlapping slightly and tucking only Bacon tip ends under loaf. 5. Bake Loaf until Bacon is crisp and Loaf registers 160 degrees, about 1 hour. Cool at least 20 minutes. Simmer remaining Glaze over medium heat until thickened slightly. 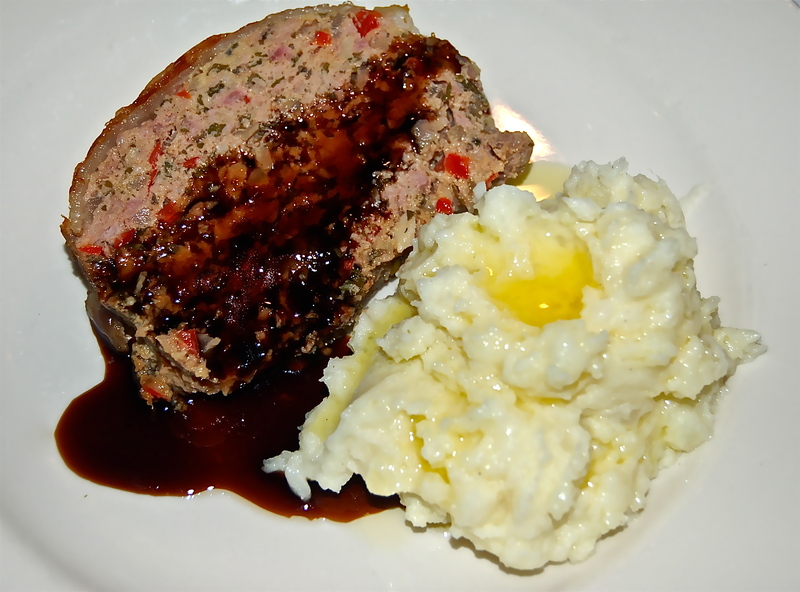 Slice Meat Loaf and serve, passing extra Glaze separately.